Synthetic turf​ is a durable, low-maintenance alternative to conventional grass lawns that is increasing in popularity for use in front yards, backyards, play areas, and dog runs. People are attracted to this landscaping option for a number of reasons. In hot, dry climates – like the one we enjoy in ​San Diego​ – artificial grass provides a gorgeous lawn in the middle of the summer. Without the watering required to keep natural grass from drying out and dying in Southern California’s heat. 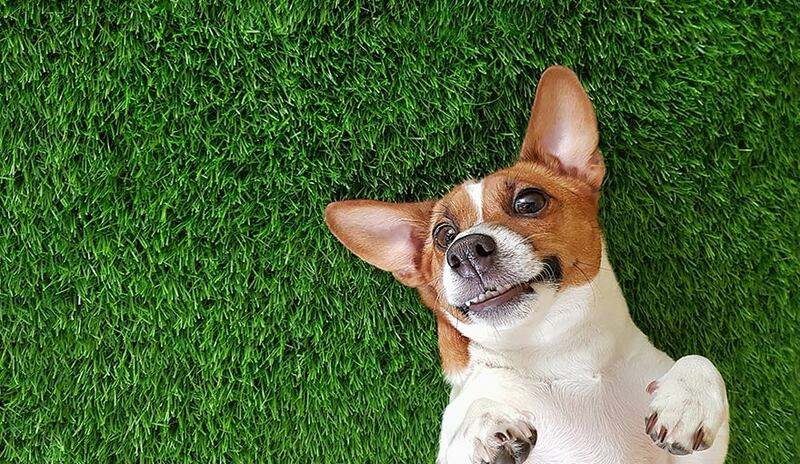 If you are a dog owner and are considering using synthetic grass in a dog run or for your lawn, you are probably wondering just how pet-friendly artificial turf is or how it holds up to frequent use. Read on to find out more about the durability, safety, maintenance requirements, and overall pet-friendliness of synthetic turf. One of the biggest questions people have when considering fake grass is if there is lead exposure involved. This is because some studies conducted on early manufactured grass options showed lead levels that caused concern. Lead exposure has been linked to a variety of health concerns, including peripheral neuropathy, cognitive impairment and behavioral issues in children. Because of this, it is good that parents and pet owners ensure their ground cover is safe. The good news is that today’s lawn alternatives not only look and feel better than older options, they also have no detectable traces of lead. The ​Center for Environmental Health (CEH)​ and major turf manufacturers entered agreements in 2008 to make sure synthetic turf would no longer pose this health concern. 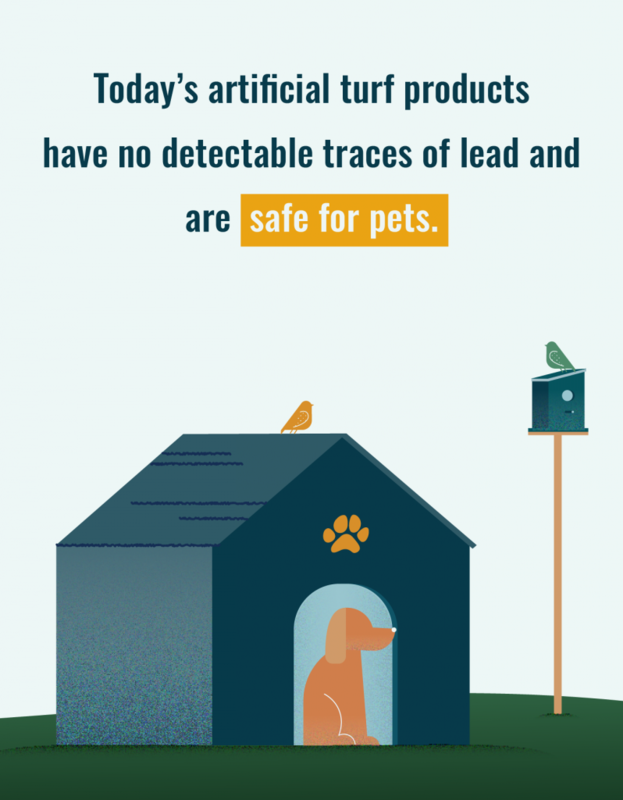 This means that, as long as you choose an ethical, reputable synthetic grass installation company, you can rest assured that lead exposure will not be an issue for your family or pets. 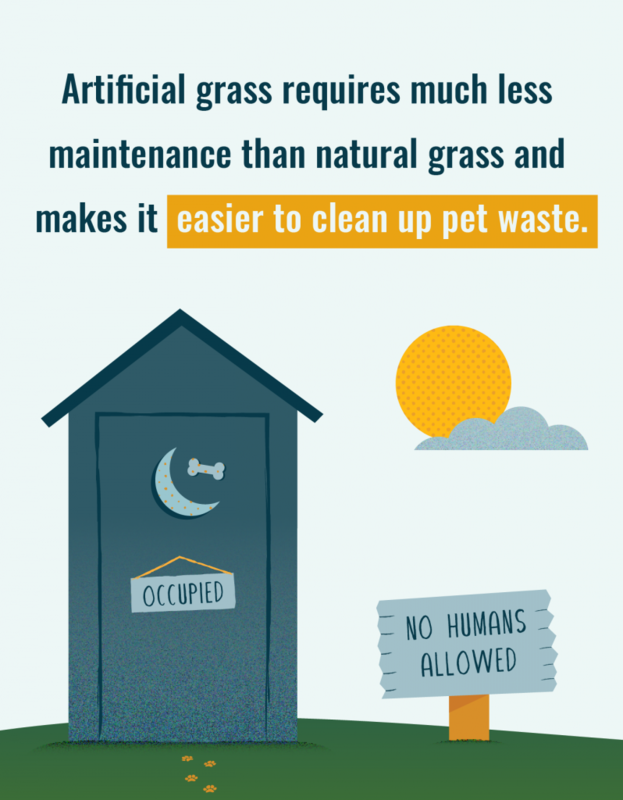 This does not necessarily mean that all existing artificial turf is safe for pets – or safe for children. If you have fake grass in your yard that was installed before moving in, and is of unknown origin, you should consider having the lead levels tested. What About Chemicals and Bacteria? Now let’s compare manufactured turf and natural grass in terms of chemical exposure and the potential for bacterial buildup. Chemical use is abundant in the ​care of conventional lawns​. Most natural grass requires fertilizers, herbicides and pesticides to keep it looking its best and to keep bugs at bay. There are organic options available for lawn care, but if you use a landscaping company to care for your yard, it may be difficult to ensure all-natural products are being used. If your dog likes to chew grass in your yard, using chemicals in your lawn care can be a concern. There are no chemicals required in the care of manufactured lawns, and overall maintenance is much simpler and less time consuming than caring for conventional options. When choosing which is the best option for you as a pet owner, you will also need to consider the potential for bacterial buildup in areas frequently used as your dog’s favorite spots to relieve himself. 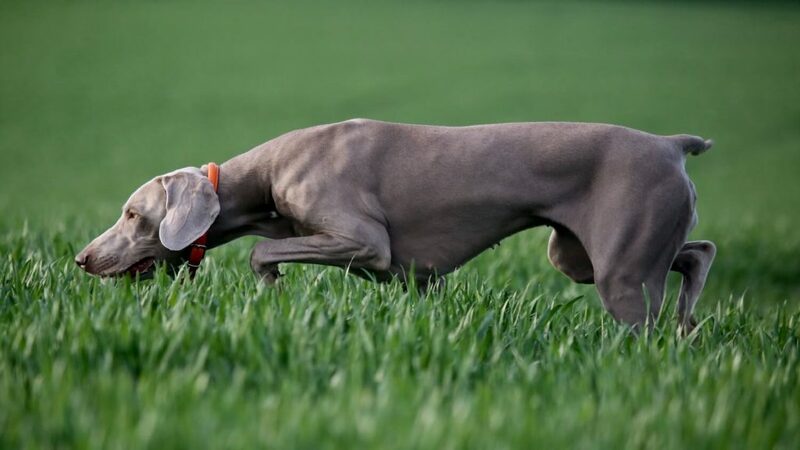 Not only does pet urine tend to develop unsightly brown spots in natural lawns, they also harbor bacteria in the soil and can be difficult to eradicate. Buildup of bacteria is usually not a concern with manufactured lawns, particularly when you choose anti-microbial, acrylic-coated infill. If you want to go an extra step towards ensuring a bacteria-free play area for your children and pets, you can mix vinegar and water in a spray bottle to spray down areas where pets frequently urinate. If you are using this ground cover option in a larger dog run, you can also treat the entire space with this vinegar-water mixture by using a spray attachment on your garden hose. While most homeowners are more concerned about tripping hazards when it comes to their children’s play areas, dogs can also be injured when playing or running on uneven surfaces. It is important to note that either option can have tripping hazards if not installed properly. For example, a sod installer could fail to properly level the dirt before laying down conventional grass. Another scenario is an artificial grass installer could fail to properly sculpt the sub-surface or appropriately address edges and seams. With natural grass that is mowed to a uniform height, it is usually impossible to see unlevel ground. If you use an ​experienced synthetic turf installer​, they will know how to address seams, edges, and the sub-surface. This will allow for a level, even surface on which your children and pets can play. In the event that your little one or furry friend does fall down, the infill used in installing manufactured lawns provides an additional cushion that also improves safety. We have already talked about the fact that you do not have to use chemical-laden products to care for fake turf, which automatically makes it a better option for homeowners concerned about exposure to chemicals. In fact, you won’t even need a lawnmower, which will free up space in your garage or shed. But which is the better option when it comes to cleaning up liquid and solid pet waste? You can use your favorite pet waste removal option for waste, which can be as simple as using a plastic bag to pick up and discard it. Solid and liquid waste could be hosed down where visible as well, for both natural grass and artificial grass. However, it is at this time where the two diverge to show that one is clearly the easier, cleaner option. When you hose down urine or leftover solid waste on natural grass, it is absorbed into the soil beneath the grass. This is where bacteria can build up and where your kids or pets can come into contact with bacteria. 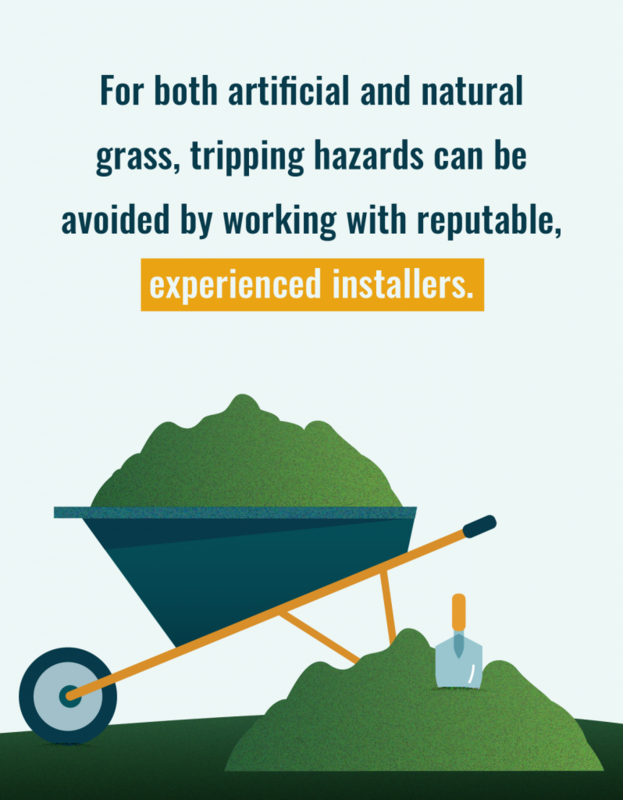 For both artificial and natural grass, tripping hazards can be avoided by working with reputable, experienced installers. The infill we use in fake grass does not absorb urine, so it can be rinsed away with a garden hose. As mentioned above, you can spray down the area with a vinegar-water mixture if you want to make sure bacteria spores cannot take hold. If you plan to use manufactured pet turf in a dog run or a yard where dogs regularly play, you will want to let your installer know when you place your order to have turf installed. This way, your installer will know to follow a specific installation process just for pet owners. When we install artificial grass for pets, we include a turf deodorizer in the base preparation, as well as the infill, to help neutralize odors from future urine. We also recommend to all of our pet owner clients that a membrane is installed between the base and the turf, which promotes enhanced air circulation. ​Turf deodorizer​ is also available for homeowners concerned about possible odor in their pet’s favorite bathroom areas, which can be kept on hand in a spray bottle to use as needed. If you happen to have a digger that leaves you plenty of holes to try to fill and cover with new grass, you will also enjoy the durable nature of synthetic turf. Dogs will find this type of ground cover to be a less inviting option for digging. Now that you are convinced that synthetic pet turf is the right choice, what kind of turf product should you install? With brands like SYNLawn, TigerTurf, EasyTurf, and K9Grass, it can be a difficult decision. Luckily, we have compiled some of the best pet turf options for you to choose from. TigerTurf Pet Turf was made for durability and comfort. This turf has a brown thatch layer and triple reinforced binding. The blades are omega shaped, which contribute to a realistic look and softer feel while being durable for high amounts of foot traffic. Made to withstand use by all sizes of dogs and their families, you can’t go wrong with TigerTurf. K9Grass Classic pet turf is the perfect product for areas with lots of dog traffic. Made with premium materials and Flow-throughTM backing, K9Grass eliminates the need for infill. Consider K9Grass for applications that require a nice dense product. Global Syn-Turf Pet Turf is great for any type of traffic and any size pet. It also has a slightly longer pile height than other pet turf options at 1 1⁄8”.The blades are ‘U’ shaped, which helps the grass stand upright after multiple uses. EnvyPet’s Pet Select turf was made to withstand any type of pet traffic from agility training to play. It is an antimicrobial, hypoallergenic and stain resistant turf option for any pet owner. 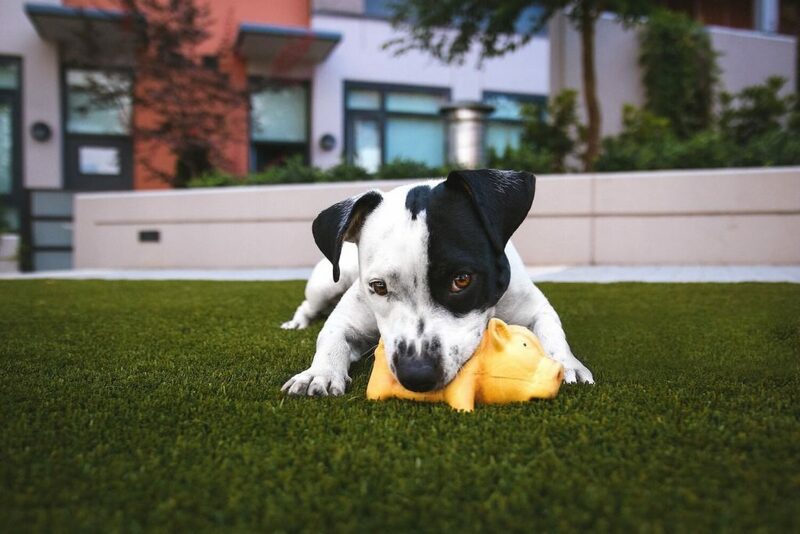 Aside from being a safe, low-maintenance option that is easy to clean and requires no chemicals, there are plenty of other reasons to choose fake pet turf. Pet owners who have had to scrub muddy paw prints out of their carpet, mop their floors multiple times during wet weather, or take the time to wipe their dog’s paws every time they come inside are sure to appreciate the mud-free environment of synthetic turf. You can also wash your dog right on your lawn or in your dog run without getting muddy. Plus, your dog’s coat will stay cleaner when they are not rolling around in grass with exposed soil. 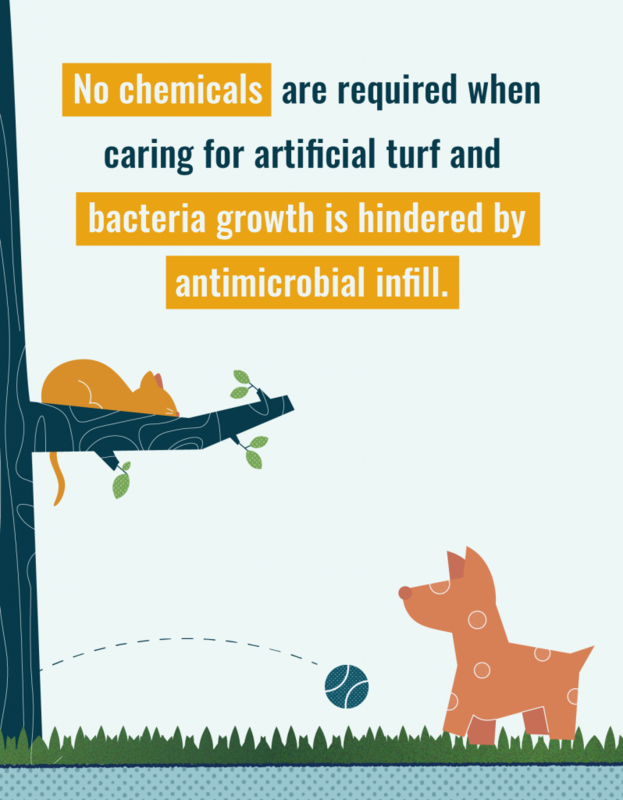 Unlike conventional grass that can become inundated with ticks/fleas just waiting to jump on your pet, synthetic landscaping turf is uninviting for pests. If you are interested in having pet turf installed in your yard, get a free estimate today! We will make sure you have a artificial grass pet area that your family and beloved dog will enjoy.